National Bloody Mary Day falls on January 1, which is convenient for everyone who may have partied a little too much the night before. Ring in the year by celebrating with the famous cocktail that consists of vodka, tomato juice, lemon juice, Worcestershire, cayenne, and salt. We’ll note that while it can alleviate hangover symptoms, it can further dehydrate you, so drink responsibly. Still, Bloody Marys are the No. 1 brunch cocktail in the U.S. Take that, mimosas. The Ontario Plowmen’s Association in Canada made the largest Bloody Mary cocktail, coming in at about 155 gallons. Celebrity chef Bob Blumer presided over the event. The idea of adding a celery stick to garnish a Bloody Mary originated at Chicago’s Ambassador East Hotel by accident. A customer didn't receive a straw, so he wound up with a celery stick to mix. Boom. While working at Harry's New York Bar in Paris, Petiot mixed the tomato concoction. It wasn't alway called a Bloody Mary. Original names of the drink included Red Snapper and Bucket of Blood! You might need some sustenance, which means making it to brunch. If there's a restaurant near you, make sure they have Bloody Marys. Get the basic ingredients, plus some goodies like bacon and olives to garnish. Then let your friends create their own unique Bloody Marys. If you were out all night, it might be nice to stay in and drink the cocktail with friends from the comfort of your own home. Sounds like a great way to start off the new year! Find the best Bloody Marys in your city and rank them. This way, you'll have a set list for visiting guests and your local foodie squad. Make sure you plan accordingly (for example, have a designated driver), and don't try them all in one day. The first Queen Mary was nicknamed Bloody Mary because of the way she tried to bring back the Catholic church to England — by executing Protestants. A Canadian-born actress and filmmaker during the age of silent pictures, she was known as "America's Sweetheart." She supposedly worked at the Bucket of Blood bar in Chicago. Some say the name came about when a bar patron said the cocktail looked like his girlfriend Mary — whom he met at the Bucket of Blood cabaret. Most of us don't wake up ready to drink, but this savory cocktail gives us permission. It's acceptable to have a Bloody Mary at brunch, and that's something to celebrate. While it can dehydrate you further, a Bloody Mary is thought to cure hangovers due to its combination of a heavy vegetable base, salt, and alcohol. This combination together can help settle the stomach, replenish electrolytes, and relieve body aches. 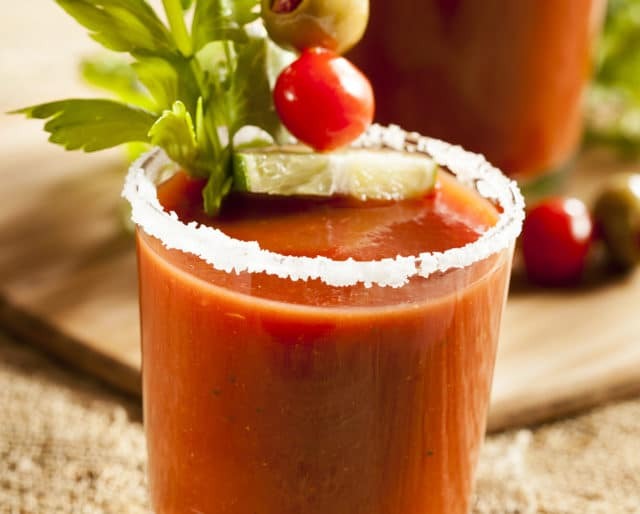 Even if you're not trying to power through a hangover, Bloody Marys are actually a great source of antioxidants, thanks to the tomatoes.